One of the standards that we have settled on is the 320HP 5.7Liter LS1 engine. The engines that we are using are brand new GM Performance crate engines. These engines are mounted longitudinally just like an authentic Lamborghini. 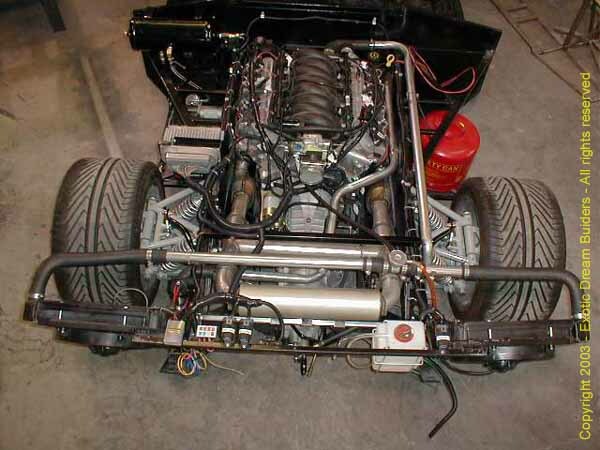 This is coupled to a Porsche 915 transaxle that has been modified to provide a more compatible gear ratio. These transmissions will allow the engine to run at approximately 2200 RPMs at 65 MPH. We are using a dual radiator system, again just like the authentic vehicle. These are 4 core high efficiencies radiators with "puller" fans which are mounted in back of the radiators to provide unobstructed air flow for the cooling. The exhaust system consists of two catalytic converters on the 2 1/2" exhaust pipe that go to a cross connection pipe to balance the exhaust prior to entering the Flowmaster muffler. The tone of the exhaust is mellow enough for comfort but has a slightly aggressive note that most will enjoy. Unfortunately, the sound of a V12 cannot be imitated with a V8 but we have strived to make this vehicle have an exotic sound. An interesting fact is that no Lamborghini has ever been built with less than a V8 engine. In fact, most Lamborghini models have actually come with the V12 engine. These engines allow the Lamborghini to cruise at top speeds, just imagine how many times these cars can drive circles around those traveling by mountain bike or cars with less efficient engines. However the Gallardo does have a V10 engine..
One of the issues all replica owners have faced is after the observer has commented on the body style and the interior they invariably want to look at the engine. Once the deck lid is opened, the V8 is revealed and the illusion is ruined. We have addressed this with an engine cover that sits on top of the LS1. It is an exact representation of a V12. The side treatments of the engine compartment compliment the engine dressing. The cover is actually bolted to the engine such that as the engine moves, the cover moves enhancing the illusion that what they are seeing is really an authentic Lamborghini. So, step away from your adjustable standing desk and prepare to learn exactly how it's done. You could grab a random manual to read at your desk, but why bother when everything you need is right here on this site? Please review each of the buttons above to understand how this power train is assembled. Please review each of the buttons above to understand how this power train is assembled.